Sydney Shop Girl: LA Story #1: See You Later, Sydney. The Shopping Begins. LA Story #1: See You Later, Sydney. The Shopping Begins. Good morning from Camarillo, California. Where I've mastered the in-room coffee machine and used it to make endless cups of tea. Sadly, there was no room for a kettle in my suitcase after all but there you have it. I've promised Master SSG that I'd bring Tiger (you might recognize him as Tigger with a 'double g' but to Master SSG, he is 'g' singular) and take photos of him on our travels so don't be surprised if you see more Tiger photos over the next few days. SydneyAirport was a gracious host, as usual. I love wandering around international departures. Anticipation is in the air, there's glamour in the storefronts and a global feel to food retail. and glossy magazines were purchased for the plane. I'm also up to speed with Jasmine and Karl (they might be engaged...). Forget Kate and the Kardahsians, when you have a cup of tea with my mum and my Aunty, having the down low and Jasmine and Karl will ensure that you'll be able to completely engage in the gossiping. In the spirit of embracing the culture of the country I was on my way to visiting, I dipped my breakfast bacon in maple syrup but think I'll stick to keeping them apart in the future. I did enjoy Ballers though. 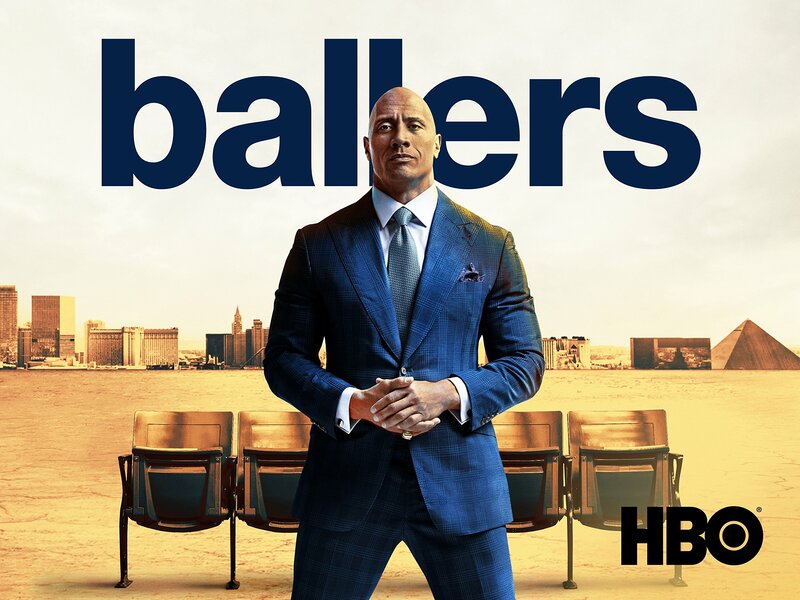 I'm a new fan of The Rock thanks to this series in which he plays a retired NFL player turned financial advisor who is trying to bring the lucrative NFL to Las Vegas. There's humour, a killer soundtrack, a dusting of 'how the other (famous, infamous and wealthy) half live' but also a fascinating insight into the world of professional sport and the people who have vested interests in its continuing profitability. If you don't post a photo on Instagram taken through your window on the plane, did you really fly at all? Thank you to everyone who recommended going Uber in LA. It's been so easy and safe to use and I've met some really interesting and lovely Uber drivers. Ubering was so efficient, in fact, that I ended up at my hotel hours before my room was ready. At the practially onsite Maccas near the hotel. The Camarillo Premium Outlets are part of the Simon chain that I've visited across the country. As a seasoned and shameless outlet shopper, I know the drill and I have my routine which I'm sure you know back to front through the blog. if you can, plan your assault over two days. A bit like Disney World. But enough on all of that. Photos from the front line. Of course I started at Lulu Lemon. Where the prices weren't much lower than the 'We Made Too Much' range online but I found some prints I loved as well as a machine washable wool sweater that I needed. This also means I do not regret buying what I did at the Australian Boxing Day Sale. J Crew Factory was offering this irresistible discount. Which prompted me to buy more black flats... I have wide feet and a very low pain threshold when it comes to footwear. J Crew addresses both these issues admirably. I fell upon this salad bar at the centre's food court. I bought way too many pairs of jeans. Before calling it a day and going back to the hotel and MASTERING the coffee machine and making a cup of tea with it. But that's not all, readers. Supermarkets here always seem to be well back from main roads while they are often more prominently located in Australia. I went for an evening stroll to an actual, suburban grocery store! I am currently staying at the Hampton Inn & Suites here in Camarillo and besides it being a convenient hotel with spacious, well thought out rooms, it is also within walking distance of a local shopping centre. I'm resisting the urge to hit up Target but otherwise, being able to mingle with locals doing ordinary, everyday things is something that is often elusive on my trips. Doing the grocery run, going to the nail bar, getting takeaway for dinner... I enjoy these windows into everyday life abroad. We have so much to discuss. This post is already way too long but I'm on a roll and waiting for the gym to open so here goes. Here are my supermarket happy snaps. Rainbow Goldfish. I was this close to bringing home this carton for Master SSG but ended up finding a smaller package instead. I wonder if he's allowed these in his lunchbox at school... They do contain (well maybe contain) real cheese. Individually wrapped prunes, truthfully called 'Ones'. This intrigues me on so many levels. Driscoll's raspberries, just like at home. Supermarket sushi. Another reminder of home. The most fascinating coffee pod award is tied between the Mild Mountain Blueberry and Krispy Kreme varieties. I saw Saltines and Graham Crackers with my very own eyes after years of reading their names in recipes and wondering what to substitute for them in their absence in Australia. Before finally leaving with two enviro bags full of groceries. I'd only gone in for bottled water after a fellow hotel guest told me that the local tap water tasted terrible before directing me to Ralphs. I bought a second bag at the store on the advice of another lady in the line. There is a 10 cent surcharge on plastic bags here. That mini bag of choc chip cookies? Bought on the suggestion of yet another local shopper. I treated myself to a punnet of blackberries before bed last night. They're plumper, larger and juicier here compared to Australia. Which reminds me. I need to find peeled grapefruit segments somewhere too on this trip. Once again, these are interesting times to be traveling in the US. It's been a year to the day since President Trump's inauguration. Women's Marches have taken place all this weekend throughout the country with key issues being the momentum gained by the #metoo movement, President Trump's record on women's issues (most recently, his push to ban late-term abortion) and in the wake of the words of powerful women stirring us all into acting for change. In addition, the government is in shutdown. For reasons too complex for me to discuss here. Timers grace the screens on all the news channels counting how long the shutdown has been in force. I'm awaiting Anderson Cooper's words on CNN. And that's pretty much how my first day here went down. This country of contrasts. Multi-lane highways as far as the eye can see run between soaring, rugged mountains. Outrageous, almost written for television politics is countered by the warmth and friendliness of people on the street.